My 1-2-3 Cents : Oh, Baby! Last week I wrote about Kharma's meltdown in the ring on Monday Night Raw and how I felt like it was an epic fail on the WWE's part. Despite hearing lots of rumors about the reasons why, Kharma herself confirmed it on the Memorial Day edition of Raw. She is in fact with child, and it is apparently a high risk pregnancy, so Kharma will be off TV for the next year. I hope the WWE doesn't "future endeavour" her. 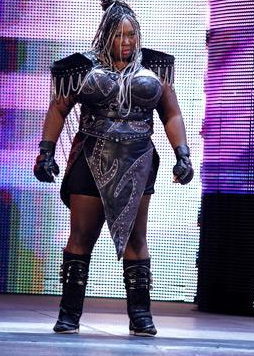 In the few short weeks Kharma had an onscreen role with the company, she changed the Divas division. I know that's a somewhat bold statement, but she seriously re-energized my interest in that division. I think it was the prospect of her getting into the ring and wrestling the likes of Beth Phoenix, Natalya, and Gail Kim (again). Her character was headed in the direction of being a monster. She instilled fear in the other Divas and tore through them. There was a huge intimidation factor there. I just hope this announcement and her time away doesn't kill any of the momentum she had. Clearly now, when she returns she'll be a face. Again, I'm not sure how I feel about that either, as I mentioned in last week's post, I think the WWE is missing that "monster heel" type character right now, and Kharma was great for that role. Should the WWE have stayed away from the real life story here and just had Kharma laid out in the back and written off TV for a year? That could have been done, and I'm not sure why they didn't go that route. How will the fans react when she returns? I've already read on some message boards that she'll never be back, that she's done. I certainly hope that is not the case. I look forward to seeing some in ring action for Kharma. I think she's got "it" and will go even further in the business than she already has. My other question, Brie and Nikki Bella are a part of the "anti-bullying" B A Star campaign the WWE is promoting. Yet, weren't their actions on Raw rather bullyish? (I think I just made up a word, but you know what I mean) And I realize this is wrestling, but why have two spokespeople for this campaign out there doing the exact opposite of what they're preaching in the PSA's? While I don't like the whole blowing over of why the Raw GM signed Alex Riley back to the WWE, I like the push he seems to be experiencing right now. However, I will remain loyal to the Miz. Good to see Evan Bourne get a win, but is it going to amount to anything down the road? I figured Dolph Ziggler would beat Kofi Kingston, that seems to be the formula in all non-title affairs. I like, no love, the fact that Jerry Lawler and Michael Cole are not bickering during each segment on Raw. It's nice to hear them actually call a match, though I do miss Jim Ross. The heel R Truth is growing on me and is more entertaining than the "What's Up?" dancing version of him. Glad to see Zack Ryder getting a little love on Raw again. Though we want to see him in the ring! That's it for now. Please subscribe here. "Like" us on Facebook. Follow us on Twitter, and subscribe to the YouTube channel. My latest Broski of the Week submission is up. Woo, woo, woo! You know it! I absolutely agree on R-Truth it seems to fit the formula in time he'll be upper teir Heavyweight Title regular.